Please see listing in Reagents for Histology: Fixing, Dehydrating, Clearing and Staining. An acidified alcohol solution for the differentiation of regressive stains. Please see the Adhesive and Mountants section. Agarose SFR™ is a high resolution sieving agarose with unsurpassed clarity. DNA bands differing in size by 2% can be resolved in the range of 200 – 1,000 bp. This agarose is suitable for the analysis of AFLP's (Amplified Fragment Length Polymorphisms), STR's (Short Tandem Repeats) and tetranucleotide repeats. The low melting point of agarose SFR™ makes it an excellent medium for analytical and preparative electrophoresis. EMS Agarose LE is a highly purified agarose, suitable for a variety of molecular biology applications. It is refined using an advanced process that excludes the use of organic solvents, yielding a cleaner end-product with a significantly reduced environmental impact. 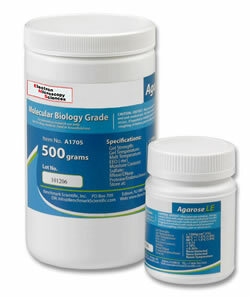 EMS Agarose LE can be used for analyses of proteins and nucleic acids of various sizes (150 bp to 6 kbp). It's low EEO (≤ 0.13 -mr) promotes increased electrophoretic mobility, yielding improved resolution and shorter run times. This also allows macromolecules and larger particles (subcellular fragments, viruses, etc.) to migrate more freely through the gel matrix. The consistently low EEO also provides a reduction in band distortion (caused by counterflow) that can result from the presence of excessive sulfate-rich negative ions. EMS Agarose LE is widely used for nucleic acid electrophoresis (analytical and preparative), protein electrophoresis (including radial immunodiffusion) and various blotting protocols. It is easily soluble, free of nucleases, and easy to use. It is highly transparent (forms a clear, colorless solution at 1g:100ml H2O), and exhibits exceptionally low absorption of chemical staining agents. Pore size can be adjusted by simple modifications to the concentration ratio. Formulated for high gel strength and integrity, EMS Agarose LE exhibits exceptional thermal stability and mechanical resistance, ensuring safe, easy handling, regardless of whether a denaturing agent has been added. Researchers trust EMS Agarose LE to meet their electrophoretic needs for a variety of applications. Now the same EMS agarose is available in a convenient, no mess tablet. EMS Agarose LE is refined in an advanced process that excludes the use of organic solvents. The result is a cleaner end product with significantly reduced environmental impact. The EMS agarose can be used for analyses of nucleic acids from 150 bp to 6 kbp, protein electrophoresis and various blotting protocols. The low EEO of the EMS agarose promotes increased electrophoretic mobility, yielding improved resolution and shorter run times. This also allows macromolecules and larger particles (subcellular fragments, viruses, etc.) to migrate more freely through the gel matrix. The consistently low EEO reduces band distortion (caused by counterflow) that can result from the presence of excessive sulfate-rich negative ions. The quick dissolving EMS EZ Pack™ tablet contains 0.5g (500 mg) of EMS Agarose LE, eliminating the hands-on time and inaccuracies normally associated with weighing. Use of the tablet is not only convenient and cleaner, it also provides better consistency and reproducibilty gel to gel. Gel preparation is simple – add the desired number of tablets to electrophoresis buffer, allow to sit for two minutes and then heat and pour as usual. The resulting gels are highly transparent, have exceptional thermal stability (ensuring safe and easy handling) and exhibit exceptionally low absorption of chemical staining agents. 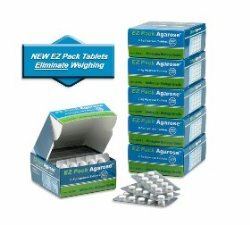 EMS EZ Pack™ Agarose Tablets are supplied in convenient blister packs for safe, clean dispensing. Aluminum Oxide 90 Basic (63-200 Micron) for use with Technovit® 9100. Ingredients: NaCl; KCl; CaCl2·6H2O and Distilled water. W.P.E. number included on each bottle. Please see listing in Embedding Kits. Bismuth specifically stains Golgi beads and interchromatin granules after fixation with glutaraldehyde, whereas it stains nucleoli, basic protein, and biogenic amines after formaldehyde fixation. Bismuth staining of sections is relatively nonspecific: it can stain glycogen, lysosomes, ribosomes, polysaccharides, ferritin, and DNA. M.A. Hayat, "Basic Techniques for TEM" p. 184 (1986). Borax Tetra, Sodium Borate, Reagent, A.C.S. H3BO3 FW 61.83 CAS #10043-35-3 Assay 99.95% minimum. A buffer component in Tris-EDTA-Borate buffer. Also used in Silver-Methenamine buffer. Swift, J.A. (1968). The Electron histochemistry of cystine-containing proteins in thin transverse sections of human hair. J.R. Microsc. Soc. 88,449. Please see listing in the Fixatives section. Please see our complete listing of Prepared Buffers. CAS #63148-65-2 (Terpolymer of polyvinyl butyl, polyvinyl alcohol & polyvinyl acetate) Polyvinyl butyl resin for thin film support. Stronger than Formvar and more sticky, resulting in a firm attachment for slotted or meshed grids. The standard solution is 0.25% Butvar B-98 in Chloroform. Handley, D.A., et. al., Ultramicroscopy, 4,479 (1979). Stock solution: 1.0% in Chloroform.